Identification: Wing bases are dark. Upperside of forewing with median and postmedian bands combined into one wide tawny band. 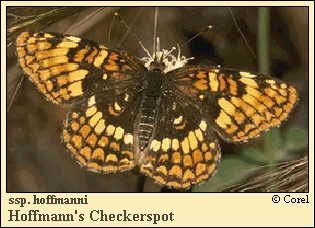 Underside hindwing spots are cream-colored, not pearly. Life History: Males patrol near the host plants for females. Eggs are laid in groups on the underside of host plant leaves, which the caterpillars eat. Young caterpillars feed together in silk webs. Partially-grown caterpillars hibernate. Habitat: Forest edges and openings. Range: British Columbia south through the mountains to Tulare County, California, in the Sierra Nevada.